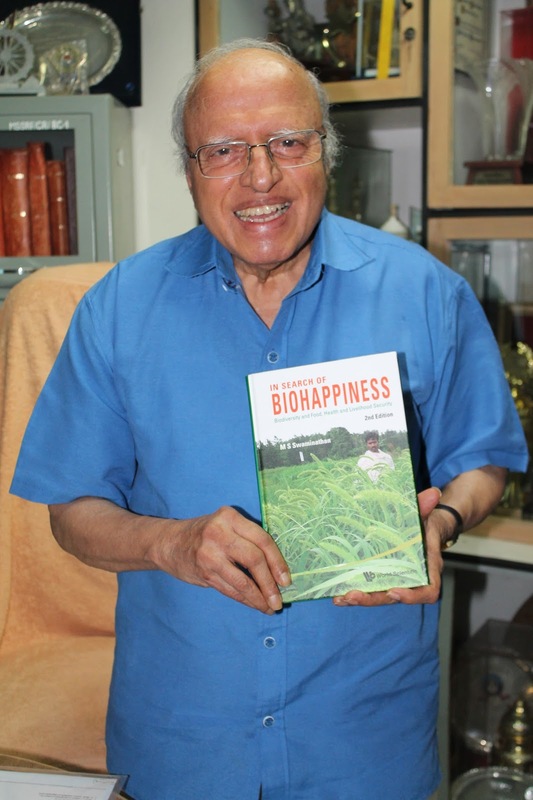 This Sunday I feature eminent geneticist Prof.M.S.Swaminathan, who, at 90, shares with me his little secret to harvesting happiness! When my meeting with Prof.M.S.Swaminathan ended, the word, ‘blessing’ kept popping up in my head on the ride back home. “What a blessing it is,” I thought, “to meet someone like him”. Not because of what he has achieved – but because of the way he is, despite what he has achieved! Titles like international geneticist, the ‘Father of the Indian Green Revolution’; honours like the Padma Vibhushan; an awe-inspiring work and travel schedule that includes fulfilling invitations from Heads of State of Afghanistan to Bhutan to Japan to Sri Lanka; all this, at 90, to Swaminathan, is “just a part of this journey called Life”! In Swaminathan’s presence you can’t but help wonder how he is so much at peace with himself and with the world around him. Swaminathan considers himself very fortunate that he always got the right support to be who he wanted to be. “Although I lost my father when I was only 11, my family has helped me go do what I loved doing. First it was my uncle, then it was my wife Mina and my three daughters. I believe your family plays a big role in your happiness,” he explains. Adding, “And of course, I had the opportunity to be led and surrounded by people who gave me the freedom to express myself through my work. I have been very, very fortunate to have achieved all that I set out to achieve.” Swaminathan recounts an incident from 1961 when he received the Shanti Swarup Bhatnagar Award from the then Prime Minister Jawaharlal Nehru. One week later, Nehru invited him to his office and asked him, “Young man, I remember giving you a prestigious award last week. Tell me, what did you do to deserve it?” When Swaminathan explained his research focus, Nehru thumped his back and asked him to forge ahead. “Whether it was Nehru or later Indira Gandhi or C.V.Raman or C.Subramaniam, everyone I looked up to has only been supportive,” informs Swaminathan. Quoting French philosopher Marquis de Condorcet, Swaminathan says, “Population will stabilize itself if children are born for happiness – not by chance, but by choice.” The World Happiness Report 2015 ranks India at 117thposition among 158 countries surveyed. Swaminathan refers to this report and believes we need a reorientation of our value systems to shift the focus from material wealth to happiness arising from the joy of sharing and caring. His modest office in Taramani is lined with dozens of awards – from across the world. In fact, there’s no more shelf-space to hold the next one when it arrives! Each of these awards has been accompanied by a cash prize in celebration of Swaminathan’s scientific genius. But he’s given it all away to further research at the M S Swaminathan Research Foundation. “I believe in Gandhi’s philosophy of trusteeship – I don’t need to own anything more than what I need. My work is not my own. So many people, so many efforts, I have no right to take any of what I got for myself,” he says. Swaminathan says he’s enjoyed every moment of the ‘60 years of adventure’ he’s had with agricultural research. Along the way, watching his daughters grow up and settle down, seeing his wife find joy in whatever she chose to do, reading Aurobindo and Ramana Maharishi – all these, he feels, make him happy. “And, of course, listening to T.M.Krishna live is such a delight – he always elevates you to a new high, takes you to a new horizon,” exults Swaminathan. Humility and divinity truly converge in Prof. Swaminathan. Maybe that’s why he’s so happy, so peaceful – and so successful?